"Not the rum! We need you sober!" "Ow! That was my favorite hand!" If you don't recognize those lines from the text of William Shakespeare's Taming of the Shrew, it's because he never wrote them. Still, there they are, alongside a whole notebook full of added-on lines, quips, quotes, comic expositions and alternate terminology that stick out all over in Marin Shakespeare Company's rollicking new pirate-themed adaptation of Shrew. Now, I am no purist. I have routinely defended outrageous interpretations of classical texts, finding charm and innovation in numerous off-the-wall stagings of Shakespeare, including a psychedelic Winter's Tale spiced up by a visit from Albert Einstein in a moon lander. What I find clever about such shenanigans, when they work, is the way they inject new playfulness and creativity while remaining faithful to the original text. It's not easy to do, but if it were easy, it wouldn't be so impressive. Over the last 21 years, under the spirited direction of Bob and Leslie Currier, Marin Shakespeare has built a reputation for staging approachable, populist Shakespeare that pole-vaults the walls many people build around the Bard. This is a good thing, as it gives a port of entry to young people and anyone else with a fear of Shakespearean language. Usually, these plays—whether staged as Wild West shootouts, Las Vegas lounge acts or '70s hot tub parties—show a reasonable sense of fealty to the text. In this year's Pirates of the Caribbean take on Taming of the Shrew, however, director Currier has crossed a line, slashing the text to ribbons (the part of the shrew herself is cut to nearly half of what Shakespeare wrote) while inserting so many silly ad-libs and additional gag lines into the script that it's hard to believe it was created by people who actually like Shakespeare. This resembles the work of someone who doesn't trust Shakespeare—or perhaps doesn't trust the audience. Putting Shakespeare's text into entertainingly fresh settings and making each line make sense in that new context takes work and craft. We've seen Currier accomplish this many times. But here, by tossing in so much extraneous verbiage (even if it does frequently draw a laugh), Currier is at risk of making himself look lazy. This is not to say that his Shrew isn't fun. It's loads of fun, and the audience at last Sunday's evening performance ate up every bit of nautical nonsense. The key performers are a hoot, especially Darren Bridgett as a comically violent, Jack Sparrow&–ish Petruchio and Cat Thompson as Kate. Gary Grossman, delivering a piratical prologue that springs entirely from the pen of Robert Currier, is an absolute stitch, as is Mark Robinson as Tranio, a calculating goofball of a servant. 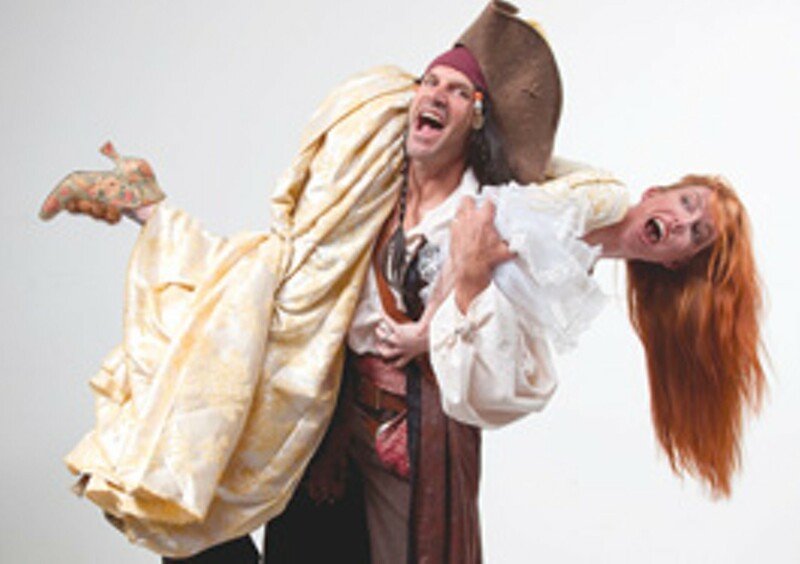 To be sure, there is much eye candy and swashbuckling to be enjoyed, but in strenuously serving the pirate concept to such a strong degree, Marin Shakespeare has done a disservice to the playwright whose name the company bears. Marin Shakespeare Company's production of 'The Taming of the Shrew' runs through Sept. 26 at the Forest Meadow Amphitheatre. Dominican University, 1475 Grand Ave., San Rafael. $20&–$35. 415.499.4488.